This small flowered Bulbophyllum species is native to South East Asia and Malaysia. 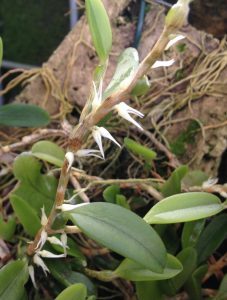 It is a member of the oxysepela section of Bulbophyllum where flowers are unusually produced from the rhizome between the small pseudobulbs. The small flowers are produced in profusion giving a very attractive plant. The plant grows high in evergreen trees at around 1000m and we find it prefers to grow quite cool and the plant shown is growing in Cool Americas where it seems much happier than where it previously lived in Warm Asia. The plant is quite straggly with its long rhizome but seems keen to wrap itself around its mount and so will be very neat in the long run as it develops into a ball of fleshy light green leaves and rhizomes covered in flowers every autumn.